From the moment I saw the trailers, I knew my father would be fixated. He was, after all, entrenched in Vietnam, as I grew in the womb of his newly wed wife. Maybe that's why, after all this time, I reached out, in a kind of simultaneous search for survival. We'd never spoken of the war before. 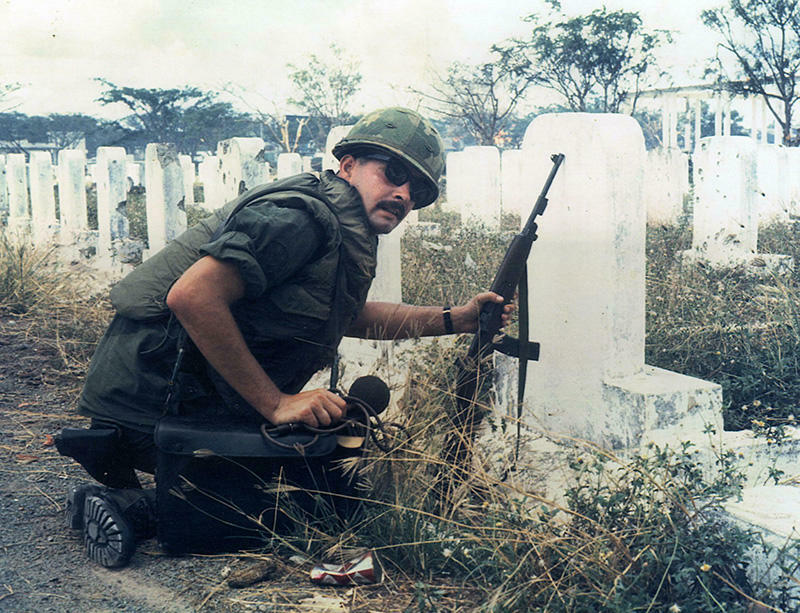 But the picture of the 25 year -old crouching among the buried, behind a cemetery headstone outside Siagon, audio gear in one hand, a rifle clutched in the other, always spoke volumes to me. This was a man clearly conflicted by war. "I never fired a single shot," he said. "The guns were for self defense. I was there to document the war." Bryan Grigsby admits he was happily playing in college rock and roll bands and guzzling beer when he was confronted by two choices; enlist and try to exert some sort of control over the Vietnam War, or wait to be drafted. He didn't see the point in waiting. He says he was number one on the 1966 draft call for Alachua County, Florida. So, he enlisted, first as a musician with the U.S. Army. Then, he trained as an audio specialist in hopes of following President Lyndon Johnson on speaking tours. But that too, fell through. So he joined a documentary photo unit in Hawaii known as DASPO, the Department of the Army Special Photo Office. There, he also learned the art of still photography, which eventually became his life's work. "I actually switched majors four times during a five year period and couldn't make up my mind what I wanted to do," said Grigsby. "The only reason I stayed in college those five years was to stay out of the draft." But he could not stay out out of Vietnam. 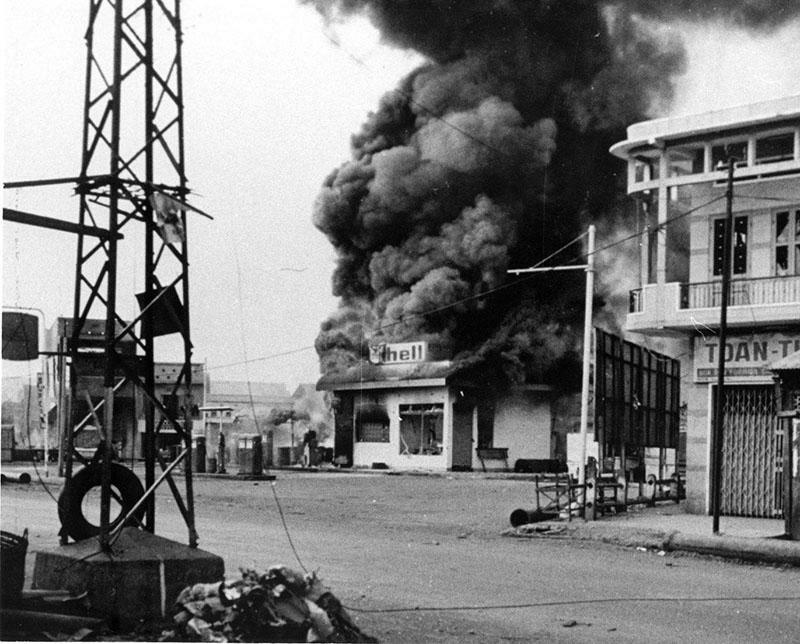 There he documented what he saw, heart racing, hands shaking as he faced his own fears, during the Tet Offensive. "My first photo assignment was a search and destroy operation with the 25th Infantry Division out of their base camp at Cu Chi on February 29, 1968," said Grigsby. "We were clearing enemy forces that were bombarding nearby Saigon. I remember being hot, thirsty and scared." Just months later, during house to house street fighting in the Gia Dihn section of Saigon, his comrade Sergeant First Class Harry Breedlove was struck in the leg by shrapnel. He was down. But his camera kept rolling. Grigsby says he was just 15 feet away at the time and was awarded a Silver Star. But a lieutenant who also responded, and can be seen attending to the Sergeant's leg, was wounded too, just days later. Grigsby believes the shrapnel came from a nearby gas station explosion. He says he was helping his injured friend and for some reason turned to look behind him. There the irony overtook him. The "S" on the Shell station had burned off. All that was left was the word "hell", in a fully engaged fire with billowing smoke. "It seemed about right to me,"said Grigsby. "War is hell." "One of the more profound projects I documented was the mortuary for soldiers who were killed in Vietnam," said Grigsby. "There were actually two facilities, one at Tan Son Nhut Air Base and another one up in Da Nang. Every soldier who was killed there was identified, embalmed and prepared for shipment back to the states for their families." "All of their personal property was also inventoried and gone through and shipped back eventually as well." 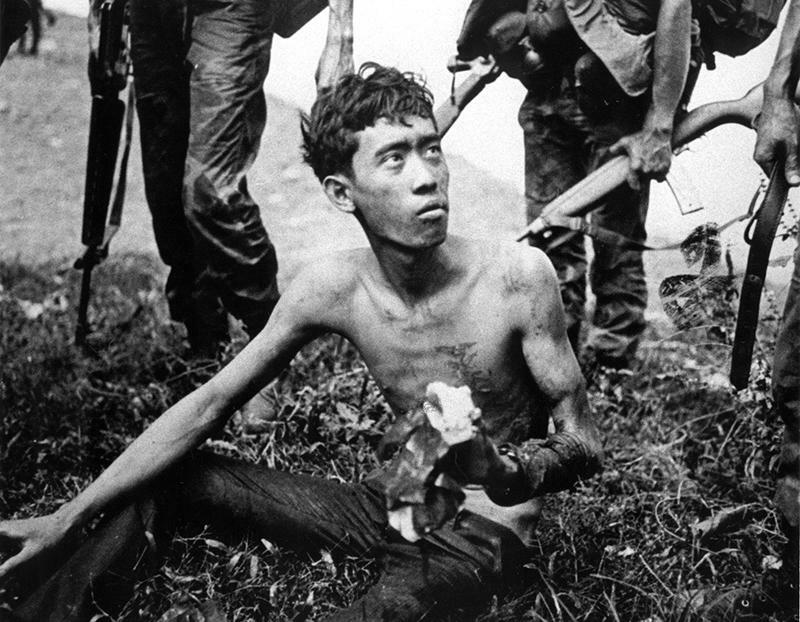 But perhaps the photo that has stayed with Grigsby the most is that of a North Vietnamese soldier captured and obviously starving. 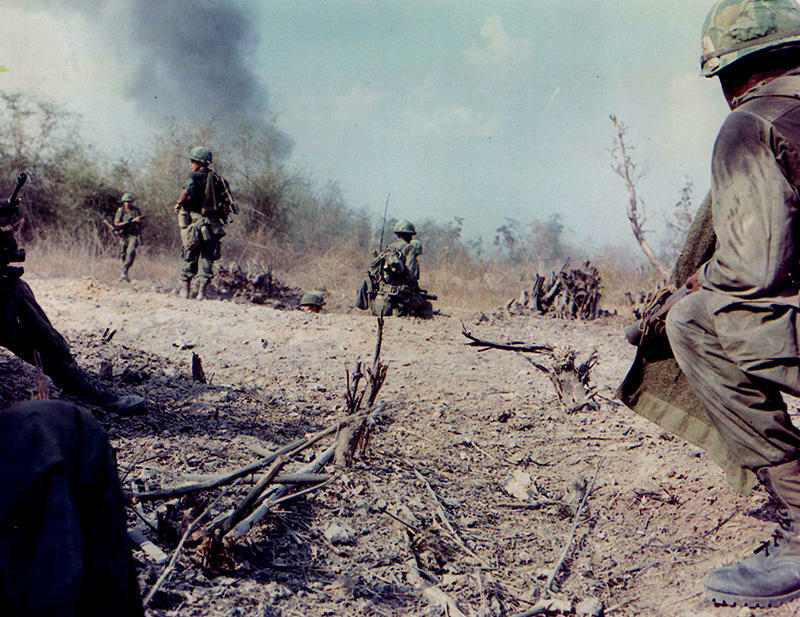 "He was surrounded by South Vietnamese Rangers and they gave him something to eat. I have no idea what happened to him, if they executed him after we left or if he went to POW camp," said Grigsby. "He looked like just a young kid. He was a soldier like me fighting for a cause I think he believed in." Their youth may have been all they had in common. "I just think it was a sad mistake. At first good intentioned people, but they got involved on the wrong side of a civil war that proved to be unwinnable." Grigsby was released from Army in January 1970. But his work as a journalist covering the aftermath of the war was far from over. He photographed Vietnamese refugees brought in at Eglin Airforce Base in Florida, and the unveiling of the Vietnam War Memorial in Washington, D.C. There, he says he nearly broke down as he exchanged glances with a woman who had just found her son's name on that wall. He was grateful, in a world growing curiouser and curiouser. He didn't need pictures to capture coming home. He experienced it through the looking glass. "I remember standing in a long line at Honolulu International Airport and seeing you and your mother looking through a large window," he said. "You were both dressed in pink if I recall. I thought you were beautiful and I was extremely happy to have survived to see you in person.